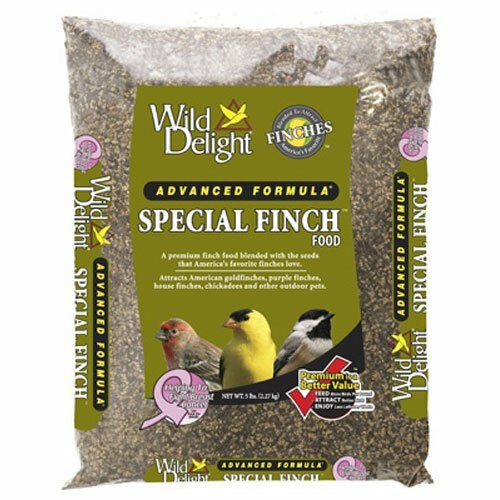 Wild Delight Special Finch Food is a premium Finch food blended with the seeds that America's favorite Finches love and no filler. Primary Wild Bird Species Attracted: American Goldfinches, Purple Finches, House Finches, Chickadees, Nuthatches, Titmice, Exotic Parakeets and other outdoor pets. Ingredients: Sunflower Kernels, Niger Seed (Guizotia Abyssinica), Vitamin A Supplement, Vitamin D-3 Supplement, Vitamin E Supplement, Menadione Sodium Bisulfite Complex, Thiamine Mononitrate, Riboflavin, Niacin, Choline Chloride, Vitamin B12 Supplement, Pyridoxine Hydrochloride, Biotin, Folic Acid, Ascorbic Acid (Vitamin C), L-Lysine Monohydrochloride, DL-Methionine, Potassium Chloride, Sodium Bicarbonate, Manganous Oxide, Ferrous Sulfate, Copper Oxide, Calcium Iodate, Zinc Oxide, Magnesium Oxide, Dextrose, Artificial Flavor. Manufacturer: D & D Commodities Ltd. Publisher: D & D Commodities Ltd. Studio: D & D Commodities Ltd. If you have any questions about this product by Wild Delight, contact us by completing and submitting the form below. If you are looking for a specif part number, please include it with your message.